See how we did it Silver State Style! Nevada has always been a land of adventure. The earliest settlers to the state, came in search of that adventure. They were willing to face the unknown for the chance of finding something truly remarkable. Sometimes these pioneers were rewarded with finds of gold, silver, rubies, and opals. Many more took their reward only in the form of living in the great wide open spaces. For more than 100 years amateur radio operators have also been blazing trails and making new discoveries. What began as a few guys tinkering with the spark coils of Model "T" automobiles, amateur radio has remained at the forefront of each wave of electronic technology during the last century. The pioneer spirit lives on, both in Nevada and Amateur Radio. Radio in the Silver State. 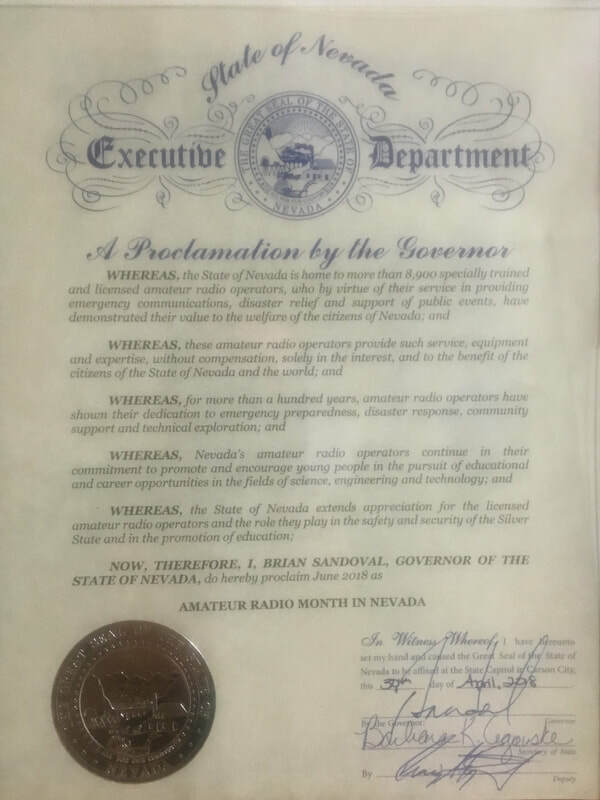 Governor Brian Sandoval has declared June 2018 to be "Nevada Amateur Radio Month"